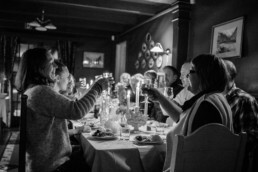 Welcome to Nyheim Lodge, food and accommodation with traditions from the English period in Sunndalen. The English period is history but there are many traces from that time, when visitors from England spent their summer holidays at the lodge, entertained by leisure activities (from 1905 until mid -1960s). 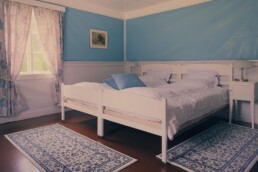 The bedrooms show traditional character, all equipped with some original furniture. Our guests have to share a bathroom with shower and toilet (a toilet on the 1st floor only is adapted for disabled people). The rooms are presently not adapted to accommodate wheel chair users. Read more about the history of Nyheim Lodge here. To book food and accommodation, please contact us. We offer lunch, dinner and coffee and homemade cakes. We offer accommodation with breakfast in six large rooms, total of 13 beds. We welcome bookings for groups.